There is a small lake in Superior Provincial Park alongside Highway 17. It is named Moose Lake. There is a clump of skeletal Black Spruce that caught my eye. I first saw this set up in 2013. We were always passing by at the wrong time. Bad lighting. This year Maureen and I spent 5 days at Superior Provincial Park in late August. What attracts me to this scene. The Black Spruce. As the sun lowers in the sky, the grayish color of the dead Spruce becomes more intense. The grey color stands out in a sea of green. The channel leading back to these skeletal trees gives me a lead in. An added bonus is that the late evening sun was highlighting the hill in the background. This in turn created a golden reflection in the foreground. Now I did not want to show to much of this golden reflection. Therefore I kept it tight. Doing this allowed for more lead in to the Black Spruce. Showing too much of this colorful reflecting would lead to a distraction. For depth we have four layers here. The shoreline, Black Spruce, The evergreens behind and then the sunlit hill in back. You may ask me if I knew that the hills would light up. The answer would be no. But I have also seen this many times . I had set my composition in the camera on the tripod. Taken a few shots. Then low and behold the hills lit up. I quickly started shooting and shortly the lighting was gone. Be there. That is all I can tell you. The Black Spruce always adds drama to your work. You can not miss them when they are in the dead form. This photo was taken on a small creek that runs out of Johnny Lake in Killarney Provincial Park. My partner, Paul Smith and I were exploring along the creek. As we made our way through wooded growth to the shoreline , I suddenly noticed the strong glow of lighting on the grasses and trees. Now there was cloud cover moving overhead rather quickly. This meant the sunlight came and went. It was late afternoon so the angle of light was right. Moving quickly I set up my tripod and Canon 7D at the creeks edge. Due to the large amount of green and yellow I kept the reflections to a minimum. The dead wood broke up the mass of green on the right. There is shadow in the background and the creek takes a bend. It was a matter of waiting for the sun to pop out from behind the moving clouds. This photo shows you what the right lighting can do to your composition. Normally this would be just an ordinary shot. I discovered this little bog island at the far end of a small shallow lake a few years ago. It is located up the Westbranch behind Webbwood Ontario. I fell in love with the potential of a composition that could be had here. This little island had character. From the shape of the vegetation; some deadheads and a clump of small evergreens. The main problem here was to be able to separate the island from the background. The lake is nestled amongst Spruce trees so everything would blend in. You would then get a bland photo. With that in mind I needed good lighting. Luckily, were I was able to set up my tripod and Canon EOS 7d the shoreline sloped upwards. This allowed me to get some separation from the far shoreline. This shot worked best in November. The sun is low to the horizon. The vegetation on the island turns a orange, red color. That helps relieve a lot of green. Now the trick is to get the right lighting. You have to have that island stand out from the background. That is very important. I made many trips to this location until I got it right. Early morning did not create the required lighting. Finally it all came together. It was a beautiful sunny November afternoon. It was 3:30 Pm. The sunlight lit the island up like a torch. The light was coming from the left which was good. I was now getting sun flares in my lens. I used my hat to block the sun flares and shot the above photo. What also helps this composition is the lighting in the background. You can see individual branches being lit up. This is what turns an ordinary photo into a dramatic composition. Lighting. The above photo was accepted at the 119th Toronto International Salon of Photography. Well I will close for now. So until next time happy trails. Jan Winther and I were walking the shoreline of a small lake up the Westbranch.It was mid-morning.The wind was calm with mist rolling off the shores of this lake.Now this is a lake that is pretty much down in a hollow.The Tamarack trees are now bare.The lakes this far North are surrounded mostly by evergreens. We are now into November,the days are shorter and cooler.The sun travels at a lower elevation now.This means the sunlight takes longer to penetrate through the trees on the hillsides during early morning.With that in mind,just close your eyes and envision a scene of a small lake in the Boreal Forest.The evergreens hug the shoreline.The sunlight is penetrating through the trees on the East side were the trees cascade down the hillside to the lake.There is mist covering the lake’s surface.There is no wind.The surrounding landscape is reflecting on the surface.This is a scene that I come across many times in my travels.To be there is a joy and to be able to photograph these scenes is a blessing. 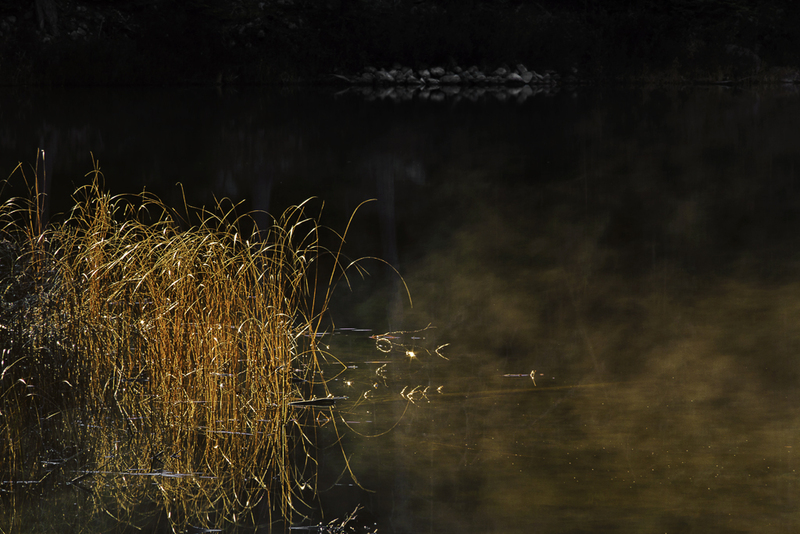 With all that said Jan and I both turned and saw the sunlight highlighting the clump of grass protruding from the lake edge.There was mist moving slowly from the shore.The background was in shadow as the sun has not penetrated that area yet.I waded slowly out into the water.I wanted to make as little disturbance as possible for the scene was only ten feet from me.The tripod and Canon 7d was set up.I composed my shot,then waited for the water to calm down again and took my shot. I intentionally kept the background dark to keep the focus on the sunlit grass and mist.